Today I’m happy to release the very first set of data from myself and Tom Davidoff. Tom is a very well respected UBC housing economist and one of the go to guys on the Vancouver housing crisis. We’ve teamed up before, like this interview here on CBC. Tom is very smart with numbers so I let him take the reigns. I worked together with him to help pull the MLS data that is available to me and provided some insights with how sales are reported, etc. As per Jason Billingsley than man behind the infamous Zolo stats, he discovered that 50% of sales take longer than 10 days to report to the Real Estate Board. So although a sale may have been signed and accepted on August 15, numbers show that 50% of those sales won’t be reported until upwards of August 25. Most likely due to lazy Realtors, understaffed offices, or Realtors leaving listings active to attract more buyer leads for their own business. So using some algorithms and coding we pulled all the MLS sales from all of 2014 to 2016. We aimed to ask: for an average home, how would the resale price have changed had the property been sold in each month between July, 2014, and August, 2016? 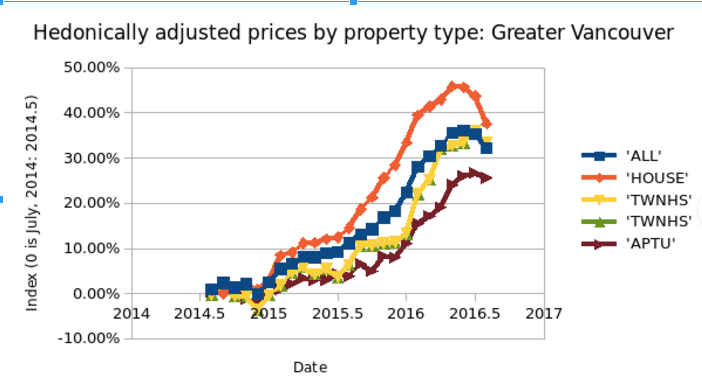 Consistent with everyone else, we find that between mid-2015 and early-2016, prices exploded in all property types, particularly detached houses. What we have discovered is that since June, 2016 sales prices decline by roughly 4% for all properties in the Real Estate Board of Greater Vancouver. However, the dip is greater for detached homes, with a correction of roughly 8%. We then “control for” location, lot size (where available), square footage, number of bedrooms, number of bathrooms, approximate age, and property type. The points plotted below reflect the effect of the passage of time on price, seeking to control for the fact that different types of properties are more commonly sold at different times. Our method of controlling for quality is not perfect, but neither is any other method. Even if we had enough data to confine ourselves to “repeated sales,” we do not observe features such as the quality of interior renovations. For this reason, it is possible that the dip in prices for detached homes may be somewhat overstated. To see the problem, while we find a roughly 4% price drop for all homes from the June peak, if we did not control for quality, we would have found a roughly 25% drop with no controls at all. We will continue to update you and revise our testing as well as break out data into sub areas. This is only the beginning and it is preliminary. Stay tuned, things are about to get interesting!